Maybe all you need to know is we're at 101.9 on your FM dial, and if you're in the Globe-Miami area, you'll hear us with absoutely no problem. If you're anywhere else, you may want to listen online. (Click on "Listen" on the nav bar and you'll be hearing us in moments.) But there's a lot more to our story. Since it first came to life in 1987 through today, KQSS-FM has been dedicated to being Globe-Miami’s radio station. Everything we do is focused on our local area. Whether it’s the music we play or the news we report, behind every decision is, to paraphrase Horatio Alger (and Groucho Marx), “Will it play in Globe-Miami?” Super-serving the area is the reason for our existence, from the listeners we entice to the sponsors we attract. The proof is in the air. Walking through town, you’ll hear KQSS in more businesses than any other audio source. Our advertisers not only realize our value, they listen to us themselves. And when it comes to advertising, no one is better at reaching prospective customers in Globe-Miami than KQSS. That’s probably in large part to the difference between us and other radio stations in the area. Unlike them, we cater only to listeners right here. And we’re proud to be their first choice. Those of us who live in Globe-Miami have unique interests and concerns. We’re located in Gila County, where less than 2% of the massive 4800 square miles is privately owned. [The Tonto National Forest comprises 56% of the county. 38% belongs to Indian Reservations. Another 4% is publicly owned including by the Bureau of Land Management and the state of Arizona. Extensive mining interests are part of the private ownership 2%.] The economy is often a challenge and growth can seem elusive. Gila County is topographically rich, ranging in elevation from 2,000 to 7,000 feet, spanning well in excess of 100 miles north/south, making it beautiful but remote. The county population of 50,000 is largest to the north surrounding Payson. 90 miles to the south, Globe-Miami is the county seat with a combined population of less than 10,000. 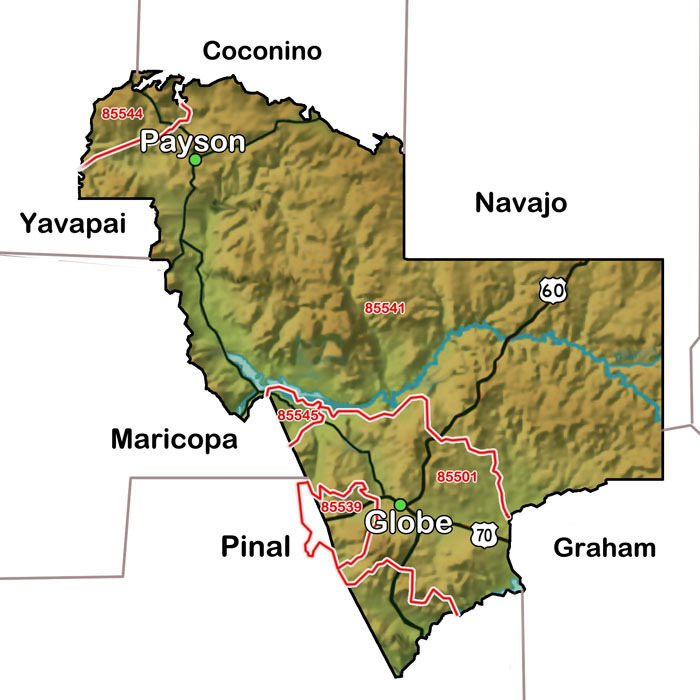 Due to distance and terrain, the Globe-Miami area is isolated, not only from the bulk of Gila County, but from the state’s vast population centers as well, particularly when it comes to media. Cable and satellite brings Phoenix and Tucson television to Globe-Miami, but for radio, the area is truly secluded. No large market signals cover it completely, and no radio stations in the northern part of the county, including Payson, can be heard at all. Complicating the matter is the lack of a daily newspaper. The result is a somewhat captive audience for local media, who have much in common with one another and little in common with the rest of the state. So why doesn’t every local station focus solely on the people here? The answer is simple: signals and money. For those with enough power to reach portions of the Phoenix metropolitan area (specifically Apache Junction and Gold Canyon), it’s more lucrative to go after ad dollars there. With KQSS, our signal is as good (or better!) than any station here in Globe-Miami, but it does not extend far beyond the area. Neither do our interests, or aspirations. We take serving the public interest seriously— delivering a lot of local news and weather, and the hopefully more rare emergency alerts, embedded in a consistently entertaining approach. Local public service announcements (for which there is never a charge) air hourly, and within every newscast. Often KQSS is where listeners first hear of local events. Our music is also locally targeted. The primarily-country blend is hand-picked by us for its appeal to listeners here, not for its national ranking. We’re equally active in community events off the air. We regularly attend, and extensively cover, town, city and county meetings. We volunteer to help any way we can from being a member of the Gila County Local Emergency Planning Committee to creating the visual backbone (from kiosk maps and a website, to over 30 geocaches designed and planted) for the Economic Development Corporation’s Way-Finding Project, dedicated to promoting tourism here. And we advocate on the air and off for better rural infrastructure, with a specific goal of bringing world-class broadband to the area. But we don’t forget why we’re in business. When it’s all said and done, there’s only one reason commercial radio is viable: it is a great delivery system for advertisers. We find it ironic that many broadcasters position commercials as a negative, when they wouldn’t be financially able to broadcast without them. Our goal is to highlight our advertisers while respecting our listeners. We never bury commercials in five minute (or longer!) clusters. Rarely will you encounter commercials back to back, and never more than two. We strive to make every spot relatable. When Bill Taylor first was awarded the license for KQSS-FM in 1984, his plan was to build a facility that would be immersed in every facet of the community. The station signed on in February 1987, and has been a compelling force ever since. Until Bill’s death at the end of 2014, his sole focus was serving Globe-Miami. To be sure, some folks were infuriated by his take on the issues of the moment, but no one doubted his sincerity, even when they were adamantly opposed to his viewpoint. To hear about Bill, in Bill's own words, listen to a recording he made about his life many years ago, when he was first facing what became unsurmountable medical problems. Jon and Rollye Cornell now own the station and are dedicated to building on the station’s legacy of local service and fun.